This post is part of a series on higher ed social media strategy. As we head into the summer lull, it’s finally time to have some breathing room to think about strategy. Like most people in this field, in the beginning, social media was handed to me as a side-project, with no real directions or expectations. In 2011, there was recognition that we should probably “do social media,” but no one, especially in leadership, truly knew what that meant. So, I spent the year building a social media program, learning higher ed social media best practices, figuring out the likes and dislikes (both literally and figuratively) of our audiences, and sharing my knowledge with other campus users along the way. We launched the university Facebook page and blog, revived the defunct Twitter account, developed a system for sharing valuable content. 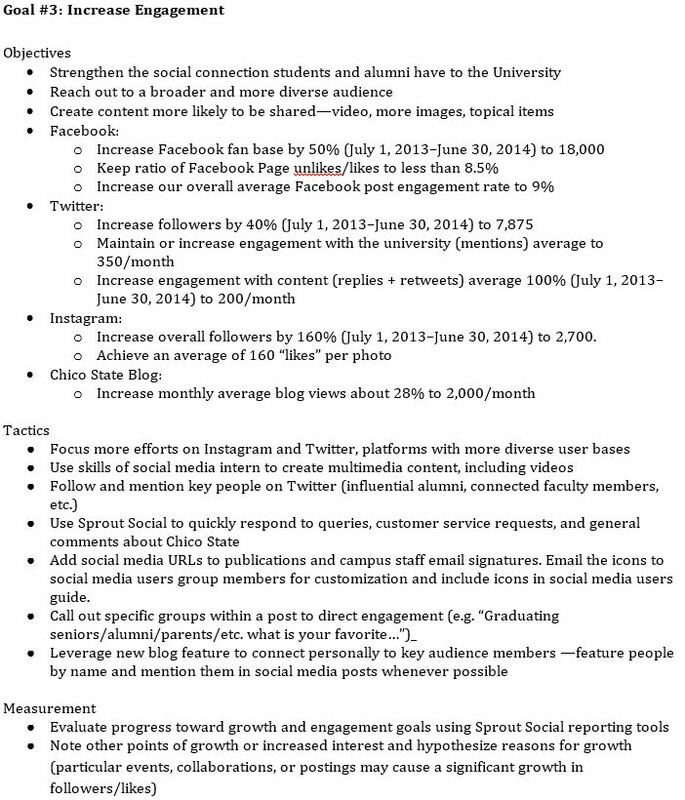 With a bit of foundation under our feet, but still no real direction from administration, I decided it was time to transfer my plan for the university’s social media from fragments in my head into an actual strategy document. Thus, the first CSU, Chico Social Media Strategy was born. It was a way for me to determine priorities and show the department head what we were attempting to do and why. The first document in spring 2012 had pretty basic, functional goals that focused heavily on building our audience, and measuring success with simple metrics (follower counts, likes, retweets, etc.). 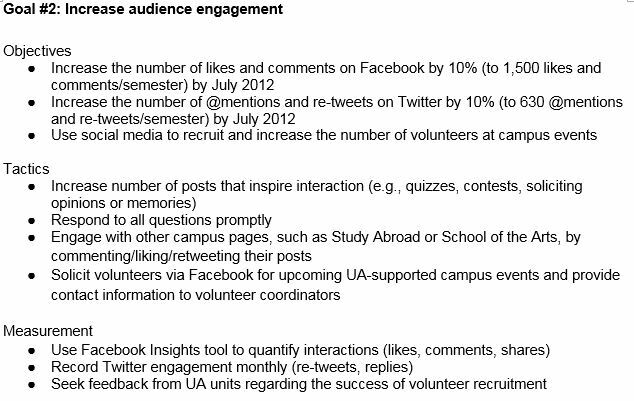 Excerpt from the spring 2012 edition of the CSU, Chico Social Media Strategy. That year, our audience numbers increased, exceeding our expectations, and became self-sustaining, so we were able to turn our efforts to improving our engagement. In 2013, we began to really see engagement as the marker of success, rather than audience volume, because of its value as an indicator of offline (or off-social media) interactions with the University. Excerpt from the 2013 edition of the CSU, Chico Social Media Strategy. In 2014, we began to make a shift towards focusing more heavily on content quality, moving our point about positive branding to the number one position. Excerpt from the 2014 edition of the CSU, Chico Social Media Strategy. With each iteration of the strategy, our underlying goals shifted and developed to reflect changes in the social media world and within our department. Additionally, the definitions of the goals, tactics, and measurements became more sophisticated. Last year, as we planned the 2015 strategy, we decided that it no longer made sense to make a social media strategy separate from the other work our Public Affairs department was doing. Everything is part of social media, and social media is a part of everything. So, the latest iteration focused on integrating social media with the rest of our media efforts (publications, websites, news releases, etc.) to create a unified digital communications strategy. 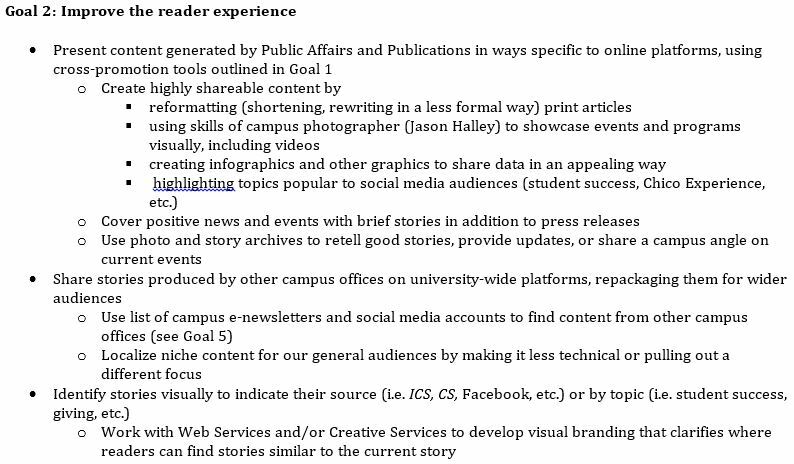 Goals for the CSU, Chico Digital Communications Strategy 2015. The 2015 strategy focused on breaking down the borders between content. We were no longer concerned with platform-specific engagement, but rather on a reader’s experience as they move from platform to platform, from content piece to content piece. If we’re doing that correctly, and producing the quality content readers want to see, social media engagement and follower metrics will increase organically. 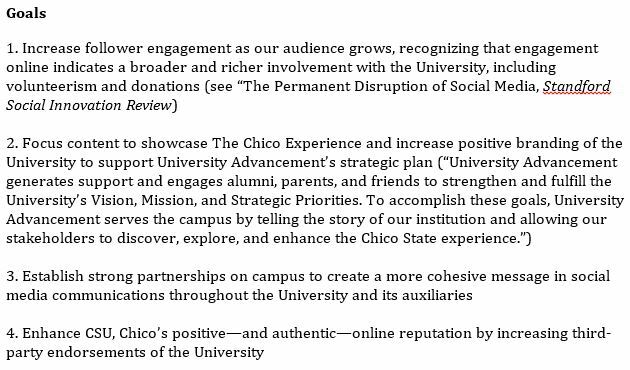 Excerpt from the 2015 edition of the comprehensive CSU, Chico Digital Communications Strategy. That bet paid off, and in a “rising tides lift all boats” situation, better social media tactics influenced better publications/web content, and vice versa. What’s next? I’ll be spending the next couple of weeks working with my colleagues to figure that out, but without a doubt, we will continue to focus on a reader-centric model that’s all about presenting great content in great ways, across all of our web, social, and print properties. What’s your social media strategy, and how did you develop it?